From time to time we offer guest blogs on Barbecuebible.com. 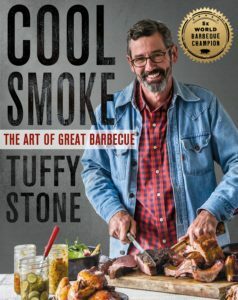 This one comes from Tuffy Stone, author of Cool Smoke: The Art of Great Barbecue. Classically trained French chef, restaurateur and head cook on the “Cool Smoke” competition barbecue team, Tuffy is a versatile pitmaster. We’ve asked Tuffy for the low-down on how he uses 2-zone techniques. I’m honored to be a guest blogger on BarbecueBible.com. Steven Raichlen has helped people all over the world be able to step up to their grill and cook with confidence. He continues to forge new ways to cook better, more interesting foods with fire. He has been a personal inspiration to me, since The Barbecue Bible came out 10 years a go. We both have in common a love for cooking with fire and started our cooking careers cooking French food. Having worked for so many years on my first cookbook, Cool Smoke: The Art of Great Barbecue, to have Steven write my forward, was so special for me. For Steven to be a part of my book is a bit surreal! One of my favorite methods to cook on a grill out side, is the 2-Zone method. This setup will have a hot side of the grill where the meat can be cooked directly over the fire. This is good for browning or searing the meat. 2-Zone will also have a cool side of the grill, where meat can be positioned on the cooking grate with no fire below the meat and is a gentler place to cook meat, where the meat can cook longer and slower without the rick of scorching the meat. This setup is great for cooking large cuts of meat like beef brisket, pork ribs, and thicker cuts of meat. I like to use this set up when cooking very thick steaks. I will start the steaks cooking them over the hot side of the grill to sear and brown them on both sides. Once each side of the steak has the color that I want, I move them over to the cool or indirect cooking side of the grill and continue to cook the steaks until they reach the desired doneness. 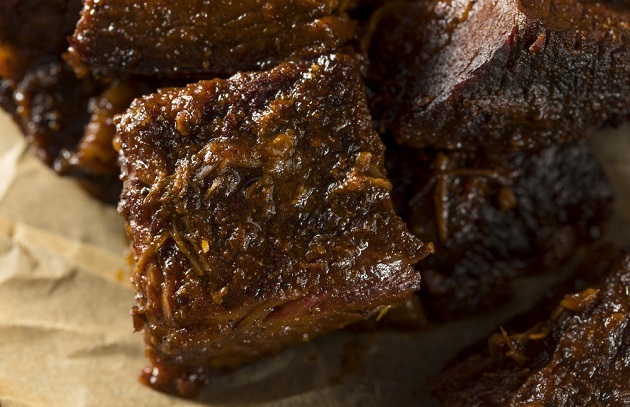 For beef brisket, I will cook the meat on the cool side or the indirect side of the grill for the entire cook. The brisket will take many hours to cook and have a beautiful color by the time it is done. When buying a grill, whether it is fueled by charcoal or gas, make sure that it has the ability to be set up 2-Zone. For a gas grill, it must have a minimum of 2 burners, each with their own temperature control, so that one burner can be on and one burner off. For a charcoal grill, make sure the bottom is large enough to have a hot bed of coals on one half of the bottom, leaving enough space for a small disposable aluminum pan to catch the grease. This will allow for a hot side and a cool side. Try 2-Zone setup to grill my recipe for Burnt Ends. Recipe available on BarbecueBible.com here.